AlphaStar Winter Computer Science Camp is a unique opportunity for interested and talented students to improve their Computer Science skills during the winter break, where students are guided and trained by expert faculty via utilizing national and international competitions in a fun and challenging environment. It is a day camp which consists of intensive lectures, practice sessions, USACO mock exams and fun activities. Winter camp is a booster camp that mainly focuses on boosting student problem solving skills in their current level. The students will be equipped with necessary background in lectures and trained with different types of problems to master various problem solving techniques. The classes are problem solving-based and the curriculum is aligned with USA Computing Olympiad (USACO). Please check USACO Website for more information about USACO. There will be four levels at the camp: CS201A: USACO Bronze, CS301P: USACO Silver, CS401P: USACO Gold and CS501P: USACO Platinum. Maximum capacity for each class is 18. The courses consist of intensive problem solving, implementation sessions and contest strategies; they don’t include teaching topics other than short reviews. Students are assumed to have basic foundation of that level. Courses cover a large variety of topics in their level with the mixed set of (about 40) former USACO contest problems and their analysis including mock exams. 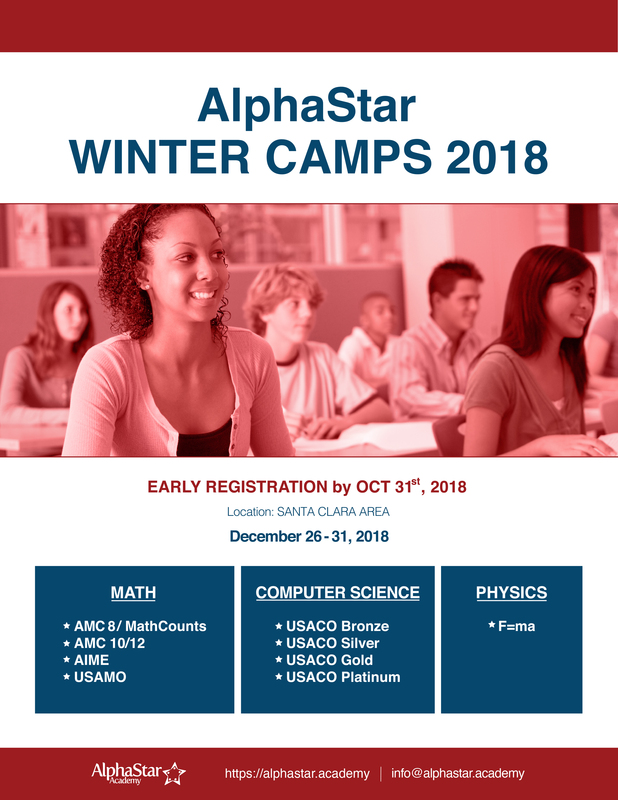 Lectures are given by AlphaStar faculty and other instructors who have participation and/or training experience in national/international math competitions and olympiads such as USA Computing Olympiad (USACO) and the International Olympiad in Informatics (IOI).